This powerhouse of a rifle round offers clean take down power for any of the largest game in North America with very few exceptions. The potent 30-06 ammunition can deliver famous ballistics for hog, deer, elk, moose and some bears; all with Grandad’s old ‘ought six. It should be no surprise the ultimate versatility of the big round and why it’s been such a popular round for so long. 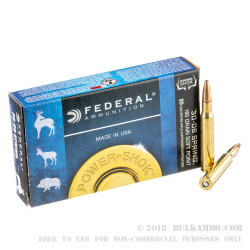 Federal has an incredible reputation for delivering cartridges with high reliability and potent stopping power. The 180 grain soft point projectile offers traditional stopping power in a round that has many decades of history hunting the biggest game. The velocity of 2700 feet per second and the energy of 2913 pound feet gives a good set of static performance numbers for just about any scenario. The load is very accurate and should easily achieve sub MOA out of most bolt actions. The price point is very reasonable, perhaps even reasonable enough for this to serve as a target round and a hunting load, because the accuracy, reliability and consistency all support that kind of capability at that price. Suitable in any .30-06 firearm and an excellent match for any bolt action guns especially. Q: Is the brass the quality needed for reloading purposes? Posted On: 3/12/14 By: Mike L.
A: Hello Mike, Yes, these 180gr. 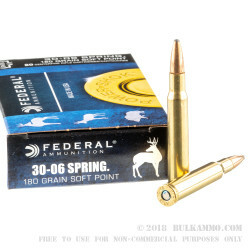 SPF rounds by Federal in .30-06 have brass cases that are great for reloading. You should have no problems with them. A: Hornady loads ammo specifically for the Garand. 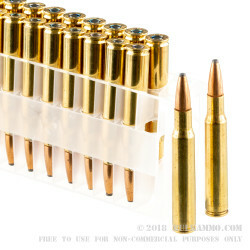 It is called the 30-06 168gr A-MAX Match Garand ammo. Q: Would you suggest this or the 150gr bullet for MN deer? Why? Thanks! A: Both would be appropriate. 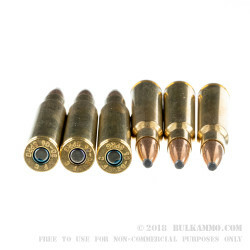 My personal choice would be 180gr because of its superior sectional density, but with proper shot placement, a quick and humane kill is essentially guaranteed with this ammo.